Little Molly Campbell has cleared the first hurdle in her treatment. We’ve been following her journey since she was diagnosed with Acute Lymphoblastic Leukemia on Christmas Eve last year. The three-month-old, began her first round of chemotherapy in early January. That stage of treatment has been completed and her most recent tests show her to be in clinical remission. Clinical remission is defined by a benchmark occurring when less than five percent of the cells, produced by the patient’s bone marrow, are leukemia cells. Molly’s bone marrow is currently producing three percent leukemia cells. Molly was essentially a newborn when she was diagnosed. She is a very young child, fighting a very rare form of leukemia. Her condition is difficult to treat and her unusually young age makes her situation even more precarious, as she is highly susceptible to infection. The tiny baby’s diagnosis, of clinical remission, is average for a leukemia patient at this stage of treatment. Had she been among the 10 percent of patients who do not achieve clinical remission status, her prognosis would be grim. Support and encouragement has been pouring in from the community and from around the world via her website and community fundraisers. Approximately $210,000 has been raised for the family, so far. That’s a wonderful help, as the infant has four other siblings, and the size of her family has prohibited them from finding space in Ronald McDonald House or other family support facilities. 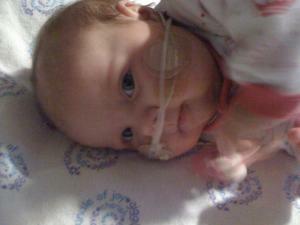 Molly’s family has relocated from Saanich to Vancouver, BC so that she can receive treatment at the Children’s Hospital. They have found a temporary home in the area. Her mother Rebekah is with her, at the hospital, constantly. Her father David, the family’s sole provider, has taken on the job of caring for Molly’s siblings. Anyone interested in helping the family through their heartbreaking situation, with either words of comfort or monetary support, will find updates on Molly’s progress and a list of upcoming fundraisers on her website www.molly-campbell.com.